The month of January in 2019 gives us a rare opportunity to visit all the themes of the ancient Feast of the Epiphany. Epiphany arose in Alexandria, Egypt in the second century of the common era, largely in response to Hellenistic religious festivals clustered around the winter solstice. Various Hellenistic and Gnostic rites noted the position of the star Sirius at the solstice, or drew water from the Nile for ceremonial washings and symbols of new birth, or celebrated the birth of the wine god Dionysos. Christians noted these themes, and fashioned their own feast by gathering from the Gospels stories of star, water, and wine connected to Jesus’ birth, Jesus’ baptism, and Jesus’ “first sign.” Because Epiphany falls on a Sunday this year, the lectionary gives us these three Gospels on three successive Sundays, a rare opportunity to observe all the elements of the original ancient Epiphany. Heavenly Father, you gave your one and only Son to be the Light of the World. Grant that your people, enlightened through your Word, shine with the radiance of Christ’s glory. May our Epiphany Lord be known, worshiped, and believed to the ends of the earth; through Jesus Christ our Savior, who with you and the Holy Spirit lives and rules as our Triune God. Amen. God you have given each of us many gifts, but sometimes we cannot recognize what gift we have to share, so we hide it under a bushel. God you remind us that all gifts are needed, but sometimes we let ourselves be convinced that some gifts are more special than others. God you call us to work, to live, to love together as parts of one body, but sometimes we decide that membership in the body is limited by our understandings. God, for the times we have ignored or mislabeled Your gifts, for those times we have cut another off from the body, We offer words of repentance, we ask for forgiveness and grace. God is the giver of MANY gifts. God is the Creator of the ONE body. God is slow to anger and quick to forgive. God helps us to heal the wounds and reunite the body. We are forgiven, loved, and accepted. 12:1 Now concerning spiritual gifts, brothers and sisters, I do not want you to be uninformed. 2 You know that when you were pagans, you were enticed and led astray to idols that could not speak. 3 Therefore I want you to understand that no one speaking by the Spirit of God ever says “Let Jesus be cursed!” and no one can say “Jesus is Lord” except by the Holy Spirit. 2:1 On the third day there was a wedding in Cana of Galilee, and the mother of Jesus was there. 2 Jesus and his disciples had also been invited to the wedding. 3 When the wine gave out, the mother of Jesus said to him, “They have no wine.” 4 And Jesus said to her, “Woman, what concern is that to you and to me? 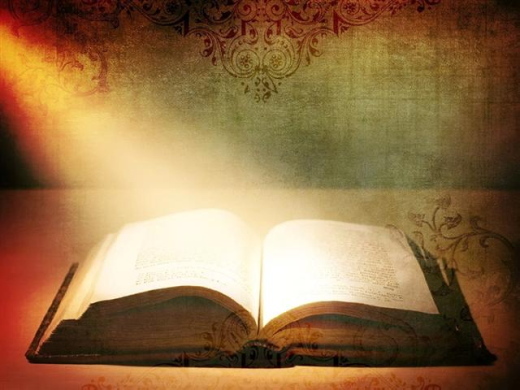 My hour has not yet come.” 5 His mother said to the servants, “Do whatever he tells you.” 6 Now standing there were six stone water jars for the Jewish rites of purification, each holding twenty or thirty gallons. 7 Jesus said to them, “Fill the jars with water.” And they filled them up to the brim. 8 He said to them, “Now draw some out, and take it to the chief steward.” So they took it. 9 When the steward tasted the water that had become wine, and did not know where it came from (though the servants who had drawn the water knew), the steward called the bridegroom 10 and said to him, “Everyone serves the good wine first, and then the inferior wine after the guests have become drunk. But you have kept the good wine until now.” 11 Jesus did this, the first of his signs, in Cana of Galilee, and revealed his glory; and his disciples believed in him. Go now from this place, remembering that the God who calls us to mission also calls us to feasting and dancing. Let us remember that there are holy days described in the Jewish texts, in which there is to be no fasting, but eating, drinking, and sharing of miracles. May the one who turned water into wine turn our tedium into festival, and show us how to alternate between commitment and carnival. May God’s will be done here where we live; may impossible things come to pass. May we find strength in the journey and joy in the struggle, through the grace of God, Amen. Our Gospel message comes to us today from John the 2nd chapter, beginning at the 1st verse. January 6 was the pagan feast of Dionysus, the god of wine. During that feast the fountains of the pagan temples on Andros spouted wine instead of water. One of the tactics of the early Church was to “christianize” pagan cults to show how Christ fulfills their hopes in a real way. So, this story, read on the feast, is adapted by John to be an “Epiphany” story, telling of Jesus’ “coming out” as divine savior. All four gospels have their “Epiphany” story: Mark, the Baptism of Jesus; Matthew, the Magi’s Visit; Luke the Shepherd’s Visit; and John, the Cana Miracle. 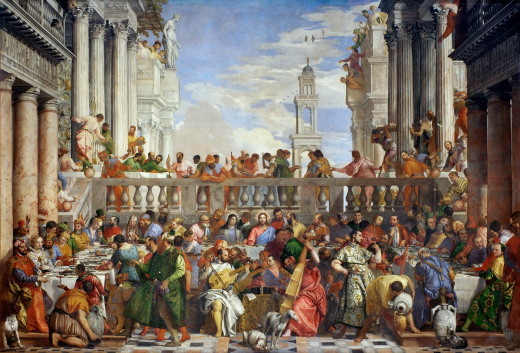 A wedding feast was a standard symbol for the Messianic banquet at the end of time when God’s enemies will be destroyed. Wine, too, was a symbol of rejoicing and fulfillment. It is a most appropriate setting to tell the story that, although God was always active in creation, something new, good, and superior has arrived in Jesus, a new creation. According to John, it is first revealed to his disciples here at Cana. Weddings at that time were really important community events. They were usually lengthy affairs, often lasting several days. They were a time for rejoicing, a time to strengthen family ties, in addition to celebrating their unique relationship with God. As a result, the families of the bride and groom would stockpile plenty of food and wine to insure that their guests would be able to forget their daily concerns, and celebrate the ongoing gift of life through the marriage of their children. Even today, hospitality is a sacred responsibility in the Middle East. It is considered an embarrassment to run out of food and drink to serve your invited guests. Even worse, it would be a calamity for the host family to run out of wine, the symbol of hospitality, especially at a wedding feast. And the fact that Mary becomes aware that the wine supply is running low, is another indication that there was a close connection between her and the host family. So Mary comes to Jesus and tells him that “They have no wine.” At first, Jesus seems to ignore her concern, saying, “What concern is that to you and me?” But Mary persisted, telling the servants of the feast, “Do whatever he tells you.” Jesus then directs the servants to fill the six large urns which sat by the door and provided the guests with water to wash the dust of the road off of their hands and feet, with fresh water. According to our text, each urn held twenty or thirty gallons, and the servants filled them to the brim. Now, we are not talking about a few bottles of well-aged wine held in reserve for special guest. Multiply it out and you get between 120 and 180 gallons of the finest wine. That’s at least 600 bottles. John then concludes this story by telling us that this was the first sign that Jesus did, which showed forth his glory, and his disciples believed in him. Thus, John invites us to witness the manifestation of Jesus as the Christ through this miracle which he performed at the wedding in Cana. But as is the case in much of John’s Gospel, what on the surface seems to be so simple, upon more careful analysis, proves to be turned upside down. How often I have heard persons say to me that if they could just be the recipient of a miracle, their faith would be strengthened. But the truth is, throughout John’s Gospel, the recipients of Jesus’ miracles are not usually the persons who come to faith in him as the Christ, God’s promised Messiah. Think about it! 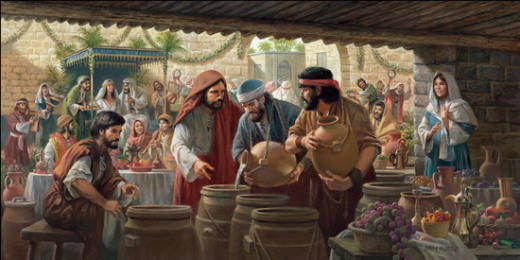 The servants of the feast were the persons who were told by Jesus to refill the urns with clean water. They were the persons who most likely breathed a sigh of relief, as the steward of the feast tasted the water, now become wine, and proclaimed it to be of the best quality. The servants knew every detail of the miracle, and yet there is no indication in our text that would indicate that they came to faith in Jesus as the Christ. Now, the chief steward of the feast doesn’t know anything about what is in the urns, or how it got there. He simply tastes what the servants bring to him, and declares it to be a wine of finest quality. He then calls to him the bridegroom, and commends him for his good taste in saving the best wine for last. The chief steward proclaims the miracle, yet he does not even know what he has done. And the bridegroom must have been totally caught off guard. There is no indication that he knew anything at all about what had just taken place. He did not buy this wine. He had not even tasted it. But he and his family were the recipients of the miracle, being saved from the embarrassment of not adequately preparing for the wedding feast. He says nothing. He knows nothing. Yet it was for him that the miracle was performed. According to John, the persons who came to believe that Jesus was the Christ, the Son of God, were his disciples. And from the previous chapter, we are told that these first disciples of Jesus were previously disciples of John the Baptist, who had taught them, prepared them, and pointed them in the direction of seeing Jesus as the Christ. In other words, they were persons who were encouraged to follow Jesus as the Christ, and to see in Jesus the signs of God’s presence. What happened that day was a “sign”, not just an amazing event. And like all signs, it has something to say, something to tell us. The disciples were able to see it, because they had been prepared to see it. According to one of the commentaries that I read, Jesus instructed the servants to use the stone jars designated for the rites of purification was significant. By turning the waters of purification into the wine of celebration, Jesus was signifying he would not only purify God’s people, but sustain our hearts in gladness. This first sign is just a glimpse of the signs that the rest of Jesus’ ministry would bring. And if we keep watching and reading, we ourselves can become open to the Spirit of God working in our midst to reveal and manifest to us that Jesus is indeed the Christ, the Son of God. We might see, in chapter 4 of John’s Gospel, that Jesus actually healed a Roman official’s son, a sign that points to the expansion of God’s care outside the bounds of Israel. In Chapter 8 Jesus forgave a woman caught in the midst of adultery, a sign which indicates that even the most painful sins we commit can be forgiven. In chapter 11, Jesus calls Lazarus back from the grave, a sign that Jesus would conquer sin and death, and open the graves of all faithful persons to life eternal with him. As you and I read these stories of Jesus, recorded in the Gospels, as we open our hearts and minds to the very grace of God at work to bring us life through this child born of Mary, we are given the opportunity to grow in faith. And by looking to these ancient stories, we are given opportunity to join those first disciples of Jesus, and see the grace of God revealed in his life, as sign’s of his glory. And what those first disciples saw, was forgiveness instead of condemnation, hope instead of despair, new life instead of death. We don’t need to be the recipient of miracles in order to perceive the presence of God in Jesus the Christ. We have the Scriptures, which point us to Jesus. We have the Spirit of God at work through our worship and our participation in the Sacraments to open our hearts to the grace of God. We have the promise of forgiveness and new life, which has been preserved through the proclamation of God’s Word by the church to countless persons for over two-thousand years. Jesus offers us new wine. It is forgiveness. It is love. And it is abundant! In closing, it should also be noted, that partying has a bad name among religious people because it connotes an abandon to pleasure at any price. Yet, Jesus attended and, we presume, participated in many parties, the wedding feast of Cana being but one of them. He has several parables and illustrations that use the party as an image of the Kingdom of God. It is okay to celebrate life, even with wine. Jesus did. Jesus set the example that we too should enjoy life. At a wedding feast in Cana Jesus changes water to wine. The disciples see his glory and believe in him. Lord on this special day, I run into Your arms. Spend cherished time with family, and find shelter in Your palm. 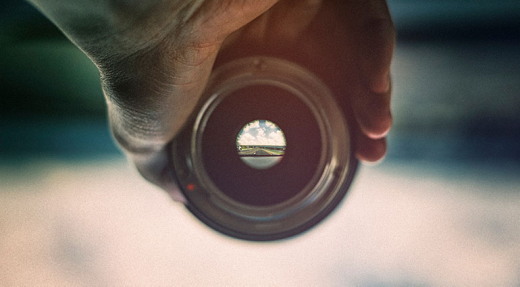 Wherever we look today, allow us to catch a glimpse of you. And whenever others look at us today, allow them to catch a glimpse of you. May Sunday be a celebration, full up to the brim, with Heaven's promise ringing loud, and Your love flowing in. James 1:2-3 (NIV) Consider it pure joy, my brothers and sisters, whenever you face trials of many kinds, because you know that the testing of your faith produces perseverance. Honra a tu padre y a tu madre [...] para que te vaya bien y disfrutes de una larga vida en la tierra. Si quieres alargar tu vida, debes honrar a tus padres. Honrar es respetar. Es fascinante saber que es un mandamiento establecido por Dios y es el primero que tiene una promesa a su lado. En nuestras palabras es bien sencillo: Si respetamos, o sea, honramos a papá y mamá, Dios nos garantiza que tendremos una larga vida. Y es tan profunda esta enseñanza que, desde que la conocí, hago lo mejor de mi parte para darles a mis padres todo mi respeto, amor y atención, aunque no viven conmigo en Estados Unidos. ¿Cuándo fue la última vez que atendiste a tu padre? ¿Cuándo fue la última vez que tuviste un detalle con tu madre? Sé que a menudo el rencor y el resentimiento acompañan el corazón de los hijos, pues en muchos casos esos padres fueron abusadores y fuertes con ellos. Nunca les dieron amor. Es más, nunca les dijeron que los amaban y, en la actualidad, esos corazones están endurecidos por la falta de perdón. Hoy es el día de honrar a papá y mamá, sin importar lo que sucediera en el pasado. Tu obligación es vivir un principio, y si necesitas perdonarlos hoy, hazlo. Llámalos, escríbeles una carta para decirles lo importante que son para ti, y esto tendrá un hermoso fruto. Te sentirás libre y entonces podrás ser obediente al mandato de Dios. Y si alguno partió con el Señor, exprésalo mediante una oración. …fixing our eyes on Jesus, the pioneer and perfecter of faith. For the joy set before him he endured the cross, scorning its shame, and sat down at the right hand of the throne of God. Consider him who endured such opposition from sinners, so that you will not grow weary and lose heart. The letter to the Hebrews was written to first century Jewish background believers who were being severely persecuted. Some were even considering giving up their faith in Jesus. The unknown author pens what many Bible scholars feel was originally a sermon about the superiority of Jesus over anyone else and everything else. He slowly builds his case to culminate in the great faith chapter. In this chapter, he also points out that some great men and women of faith lived to see the fruit of their faith while many others—also men and women of faith—died prematurely because of persecution. Now in chapter twelve, the author makes what I think is his critical statement or main point of the letter. How do we walk by faith? We walk by faith by keeping our eyes fixed on Jesus! Not fixed on our problems or difficult environment of opposition. Jesus was the pioneer and perfecter of faith. He endured opposition to the point of crucifixion. So we follow His example and we will also patiently endure because of the joy we know that is yet to come. From the mouths of children! Keep your eyes fixed on Jesus! RESPONSE: Today I will take my eyes off my surroundings, my problems, my fears and my suffering. I will keep them fixed on Jesus my Lord. PRAYER: Lord Jesus, help me keep my focus on You and in so doing bring glory and honor to You. "O Morning Star, How Fair and Bright"
"O Morning Star, how fair and bright! You shine with God's own truth and light, Aglow with grace and mercy! Of Jacob's race, King David's Son, Our Lord and Master, You have won our hearts to serve You only! Lowly, holy! Great and glorious, All victorious, Rich in blessing! Rule and Might o'er all possessing! "Almighty Father, in Your Son You loved us when not yet begun, Was this old earth's foundation! Your Son has ransomed us in love, To live in Him here and above: This is Your great salvation. Alleluia! Christ the living, to us giving Life forever, Keeps us Yours and fails us never!" When Philipp Nicolai wrote the words and melody to this song in 1597, he was a German Lutheran pastor in the city of Unna in Westphalia, Germany. While there, the city was hit by a scourge of plague that took the lives of more than 1,300 of its citizens. This widespread death so close to home impacted Nicolai in a profound way. It has been noted that more than once up to 30 graves were dug for those claimed by the rat-and-flea-borne menace, and these were laid to rest within the sight of his parsonage, his house, which overlooked the graveyard. 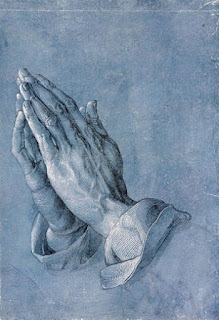 From this catastrophe, which must have struck terror in the lives of anyone near its march, Nicolai found inspiration in four different Scriptures. One of these came from Zechariah's prophecy in Luke 1. Here is John the Baptist's father, filled with the Holy Spirit and speaking exuberantly about Jesus, after being silenced by the angel Gabriel for his previous unbelief. Luke 1, beginning at verse 76, Zechariah sings, "And you, Child, will be called the Prophet of the Most High; for You will go before the Lord to prepare His ways, to give knowledge of salvation to His people in the forgiveness of their sins, because of the tender mercy of our God, whereby the sunrise shall visit us from on high to give light to those who sit in darkness and in the shadow of death, to guide our feet into the way of peace" (Luke 1:76-79). How comforting the words of Zechariah must have been to the hymn-writer. All around him, encroaching nearer, death was spreading its black mass over the city. Left and right, Nicolai's parish members were being claimed by this horrific disease, dying terrible deaths as their organs failed and their bodies shut down. 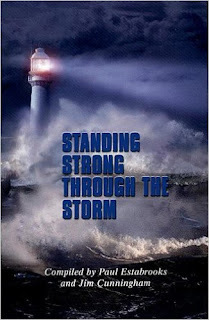 And in the middle of this devastation, God's Word speaks. The Promised One has come; His arrival brings the knowledge of salvation, the forgiveness of sins, and a light to those who sit in darkness. 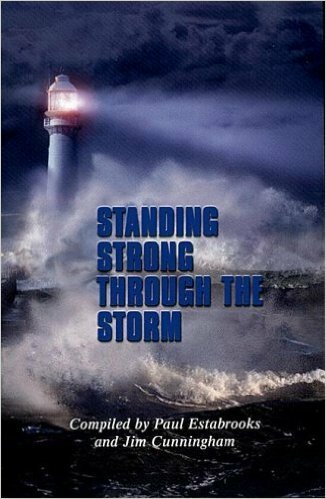 We, too, may face devastations of various kinds in our lives. We do well to remember the hymnist's line from verse four and keep our eyes focused on the Son: "O Morning Star, how fair and bright! You shine with God's own truth and light ... Our Lord and Master, You have won our hearts to serve You only!" THE PRAYER: Heavenly Father, when this world overwhelms us with its grief and woe, remind us through Your Holy Spirit to keep our eyes fixed on Your Son, our Morning Star eternal. In His Name. Amen. 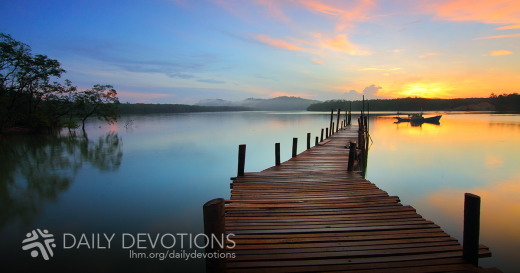 This Daily Devotion was written by Paul Schreiber. It is based on the hymn, "O Morning Star, How Fair and Bright." Used by permission; all rights reserved by the Int'l LLL (LHM). When Philipp Nicolai wrote the words and melody to this song in 1597, he was a German Lutheran pastor in the city of Unna in Westphalia, Germany. While there, the city was hit by a scourge of plague that took the lives of more than 1,300 of its citizens. Unser Täglich Brot - Wohin gehst du? Dieses einfache und doch tiefgründige Prinzip lässt sich auch auf unser geistliches Leben anwenden. Wenn wir „zielfixiert“ sind — uns auf unsere Probleme und Kämpfe konzentrieren — werden wir fast automatisch unser Leben um sie herum orientieren. Die Bibel aber ermutigt uns, dass wir über unsere Probleme hinausschauen, hin zu dem Einen, der uns helfen kann. In Psalm 121,1 lesen wir: „Ich hebe meine Augen auf zu den Bergen. Woher kommt mir Hilfe?“ Der Psalmist antwortet dann: „Meine Hilfe kommt vom Herrn, der Himmel und Erde gemacht hat… Der Herr behüte deinen Ausgang und deinen Eingang von nun an bis in Ewigkeit“ (V. 2; 8). Manchmal scheinen unsere Hindernisse unüberwindbar. Aber Gott lädt uns ein, auf ihn zu schauen, um uns zu helfen, über unsere Probleme hinwegzusehen, damit sie nicht unsere Perspektive dominieren. Vater, hilf mir, dass ich nicht „zielfixiert“ bin, sondern auf dich schaue, wann immer ich vor beängstigenden Hindernissen stehe, während ich dir auf dem Weg des Lebens nachfolgen möchte. Was bestimmt unsere Richtung im Leben? Ich hörte einmal an einem überraschenden Ort eine Antwort auf diese Frage: in einem Motorradkurs.